Trooper Gragido was killed when his police motorcycle was struck by a vehicle that had run a red light at 63rd Street and Archer Avenue in Chicago. Trooper Gragido was waiting for the light when the incident occurred. 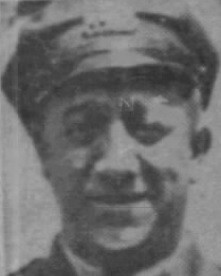 Trooper Gragido was a U.S Navy veteran of WWI and had served with the Illinois State Police for ten years. He was assigned to District 4 and was in line for appointment to Senior Sergeant. Trooper Gradigo was survived by his wife and child. My name is Mary Joann Gragido Paoni, I was born 3/27/1939, Mother Cabrini Hospital, Chicago, Illinois, Rocco Vito Gragido was my father. From what I understand his partner Officer Good & he were both waiting for the light to change, a Miss Goldstine had a seizure, s mtepped on the gas instead of the brake, drug Rocco, his motorcycle, hit several cars, a truck & went through the glass store window. I have often wondered what life would be like if he had not been killed when I was only 18 months old. My Mother took me & moved back to Springfield Illinois where she had been raised.